Containers of silence for the digestate. The selection of tailored solutions has evolved over time with the aim of providing clients with professional and relevant designs. Concrete offers extraordinary building properties such as strength and ease of processing, which made it a ubiquitous material in various areas of the building, including energy and the environment, which are served by SMEA Engineering. When at the end of 1800 the iron was introduced in the structures construction, the building sector, which had been based on the interventions of masonry, underwent a remarkable change. Until then in fact the metal had been used only in the most complex and important works (such as bridges or skyscrapers) while for civil constructions was used cement, material resistant to external corrosion but not very elastic. The further spread of reinforced concrete gave way to the masonry overcome also in the civil ambit. This mix gives to the material the successful characteristics of cement (low cost, formability and resistance), and iron (strength, elasticity). The concrete is obtained by combining the concrete and the iron, the latter usually in the form of 3 cm diameter rods, placed where we expect higher stress. Concrete is the dominant component in the reinforced concrete, and it is in turn formed by aggregates mixed with cement subsequently impregnated with water, so that the chemical reactions that allow the substances to bind each other can be activates. The water thus is necessary both as an adhesives activation agent reactor, and as a thinner that makes possible an easy processing. The cement is the binding key that allows inert and the iron to become one thing. This substance is composed by approximately ¾ of clay and ¼ of limestone, which are grounded and baked at high temperatures. In the generation of the concrete, it is necessary to formulate the right dose of the mixture, since an excess of cement would result in a loss of strength, and likewise little of it would not allow the aggregates to bind enough. Inert of small size, such as sand. The optimal result is obtained by mixing a right variety of small stones and granules of various sizes, making the concrete varied, but also by carefully choosing the quality of the aggregates: there must not be present for example, clay and organic materials that dehydrating can weaken the structure. Likewise, the rocks do not have to be tender and possibly the sand must be siliceous. Once prepared sands and gravel, and had thoroughly mixed the whole with the right amount of cement, it’s time to introduce the key for the chemical reaction to occurs and for the mixture to becomes concrete: water. It should not be poured at the sole purpose of moistening the mixture, but it should also make it ductile and malleable, and then goes dosed so as to obtain a thick but ductile substance; an excess of water, however, would makes the concrete less resistant, hence also in this case is necessary a good calibration. Given its high workability and its excellent resistance, reinforced concrete it is well suited for a huge number of industrial works. An example are the tanks and settling tanks installed in treatment plants: their role in the purifying phase is well supported by this material, allowing us to create the container tailored to every need. Another application is in the fire tanks, necessary sometimes also of considerable size to contain all the required water to ensure the whole plant safety in the case of flames. 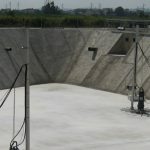 Even in the biogas or biomethane energy production context, reinforced concrete is used for the construction of tanks or tanks of sewage for digestate or biomass, where take the form of relatively large pools, essential to store material awaiting his more reasonable use, without being released into the environment, and optimizing the economic rent.